It’s reported that most of those killed were villagers on the ground. 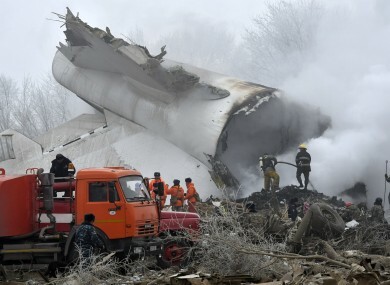 A CARGO PLANE crashed in a residential area just outside the main airport in the Central Asian nation of Kyrgyzstan this morning, killing at least 37 people according to the Emergency Situations Ministry. Reports of the death toll range from 31 to 37 people, according to emergency officials and the presidential press office. Images from the scene showed the nose of the plane stuck inside a brick house. More than a thousand rescue workers were working on the scene by late morning in the residential area where 15 houses have been destroyed, Deputy Prime Minister Mukhammetkaly Abulgaziyev said. The cause of the crash was not immediately clear. Kyrgyz Emergency Situations Minister Kubatbek Boronov told reporters that it was foggy this morning at Manas when the plane came down but weather conditions were not critical. Until 2014, the US military operated a military installation at the Manas airport, using it primarily for its operations in Afghanistan. Turkish Foreign Minister Mevlut Cavusoglu called his Kyrgyz counterpart, Erlan Abdildaev, to offer Turkey’s condolences, the Turkish Foreign Ministry said. Email “37 dead after Turkish cargo plane hits village in Kyrgyzstan ”. Feedback on “37 dead after Turkish cargo plane hits village in Kyrgyzstan ”.